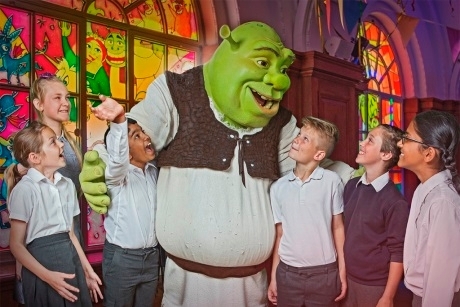 Madame Tussauds, Shrek’s Adventure! London and The London Dungeon have launched school workshops that link to English, Science, History and Business Studies. The attractions are part of the Merlin Entertainments group which owns 117 attractions worldwide, many of which offer school programmes, workshops and discounted rates. The new Key Stage 1 workshop at Shrek’s Adventure! London lets students discover the ingredients behind creating a story. It will allow them to explore plot, event sequences and characters, and pupils will be encouraged to do so through role play. The Key Stage 2 workshop will expand on the Key Stage 1 workshop and school children will be able to delve into the role in which each character plays in a story, taking into account their feelings, motives, thoughts and actions. These new workshops tie in with the National Curriculum for English. The London Dungeon has introduced the ‘Show Curator’ and Spread of Disease workshops. The ‘Show Curator’ session allows pupils to go behind the scenes and discover how live action shows are constructed. This workshop can be catered towards various subjects and teachers can choose which topics they would like to be covered. The Spread of Disease is suited to Key Stage 4 students and looks at health, disease and the development of medicine – tying in neatly with the Science and History curriculum. For Key Stage 1 and 2, The History of Marie Tussauds workshop familiarises pupils with the history of the attraction and teaches them about the lady behind it all. Students will get to work together to create a timeline and their own fact file. For students entering Key Stage 4 and 5, the Customer Service at Madame Tussauds London workshop is available and looks at customer service, tying in with Business Studies. This gives an insight to all the areas in which the attraction provides customer service. For more information visit www.merlinentertainments.biz.